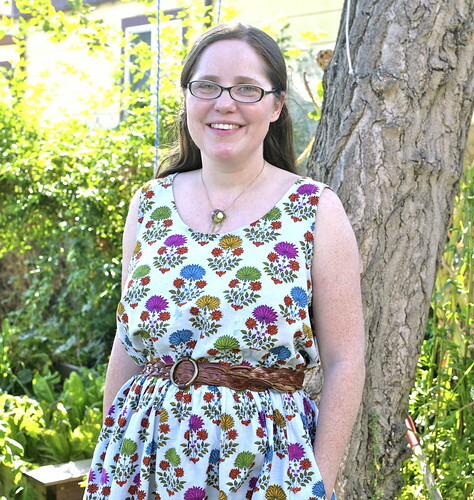 Inder Loves Folk Art: A heavily modified Eucalypt dress. As you know, one of my sewing goals is to sew more lovely things for myself. Because, unlike my children, I actually need new clothes. And unlike one of my children, cough cough Joe cough cough, I actually appreciate hand-made clothing! So far, it has been a bit of a learning experience. I realized that if I'm going to successfully sew for myself, I am going to need to learn more about fit. One technique I definitely need to master is the "full bust adjustment," known in the biz as an FBA. I recently had myself properly sized for a bra and discovered I should be wearing a size 32G-FREAKING-ENORMOUS. I thought I was a 34DD, but no. While it was a rude awakening ("WHAT? I didn't even know cup sizes went that high! "), I am thrilled to have bras that actually fit. So, wow, I am five cup sizes bigger than the B-cup most patterns are drafted to accommodate. While being quite petite in the rib-cage and across the back and shoulders. No wonder I have such a hard time getting a good fit from blouses, RTW or otherwise! This is why I mostly wear knit tops. It seemed easiest to learn the FBA technique on a very simple pattern. So a few weeks ago, I started playing with Megan Nielsen's "Eucalypt Woven Tank" pattern. This is a basic woven tank pattern with no darts or bust shaping at all. I dutifully "muslined" the pattern straight out of the envelope and sure enough, duh, I need a full bust adjustment. So I broke out my copy of Fit for Real People and did a full bust adjustment, adding a dart on the side for a little more shaping. With muslin number #2, the good news was that there was plenty of ease across the bust and the darts were in the right place. The bad news was that it was way too big! While the additional ease was needed across the bust, it was not needed so much around the waist area (note, I did not add vertical under-bust darts). Which brings us to muslin #3, a.k.a. "wearable muslin," a.k.a. "my new breezy summer dress, yay!" I've had this lovely yardage in my stash for years. It's a very soft lightweight cotton with a pretty Indian print that used to be curtains. I picked it up at a garage sale years ago for dollars and have considered using it again for curtains! That never happened, but I could never find the perfect project for it. Doesn't it just scream breezy summer dress? I think so too. With this version, I took out some of the extra ease (but not as much as I should have), took a bit of length off the shoulder straps, cut the tank off at the waist (well, probably could have moved it up a smidge), gathered a skirt onto the tank, and zig-zagged some thin elastic onto the waist. Ta-da! A simple dress. I couldn't resist adding a subtle "hi-low" hem to give the dress a little extra interest. And of course, pockets! Gotta have pockets! I have to say, this dress is just so pleasant to wear - so light and comfortable on a warm summer day. Yes, I know the rest of the sewing blog world is talking about how the summer is almost over, and making plans to sew clothes for autumn, blah blah blah. I say hush, you. August and September are the nicest months of the year in the Bay Area, and my summer is still in full swing! I have in no way resigned myself to the onset of autumn. Nope. Take that, autumn. 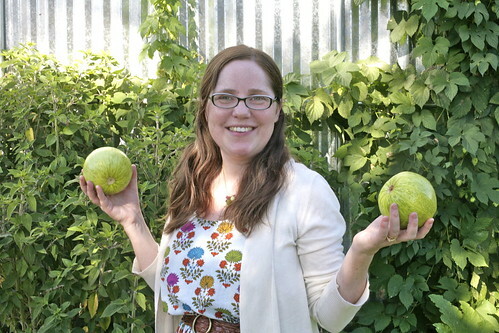 You know those lovely staged photos of women in flowing dresses wandering through fields of flowers; here is my take on that trope: I am "wandering" through sprawling summer squash plants, with a healthy hops vine growing up on corrugated aluminum behind my head. Pretty romantic, right? Look, I found a summer squash! Things I will change for muslin #4: It is still too big! I either need underbust darts, or I need to take it in quite a bit more. I like "blousy" but this verges on "poofy." If I do another dress, I will also move the waistline up a little bit. This is still a work in progress, but I feel like I'm getting somewhere on this selfish sewing journey, and that's gratifying. And it looks cute with a cardigan too! Anyone want some summer squash? It is that time of year (i.e., the time of year when you regret planting so many squash seeds) and we have plenty to spare. An aside: I have been growing my bangs out for about a year, and they are finally long enough to tuck behind my ears. So of course, now I desperately want bangs again. Check out my Pinterest board - it's bangs, bangs, bangs, and more bangs! I hope I'm woman enough to admit when I've made a mistake - I just really like cute bangs. I don't feel as hip without them. Do let me know your thoughts, I have a hair appointment next weekend. i adore the veggie patch pics :) and bangs have never worked for my sort of curly, mostly unruly hair... so i say forget them! seriously, though, i like without. but maybe long-ish ones? so they'll grow out quickly? just in case. oh! and the dress is lovely! So that's the thing about bangs. They are hellacious to grow out. Even long ones, ask me how I know! Having come this far, do I want to risk having to go through it again? GAH. I can't decide! My veggie garden is going full bore ahead these days, that's for sure! Squash are VERY romantic -- particularly the name. (I am only half joking -- whoever added "butternut" to "squash" was just inspired.) Awesome post. I don't know what I like better about it: your hilarious writing or your gorgeous sewing! "Wearable muslin" indeed. When I posted the bottom photo on Facebook, I got a lot of "Nice melons" comments. It's a very sensuous fruit, haha! I agree...I don't know what I like better (about all of your posts really!) your hilarious writing or your beautiful sewing! 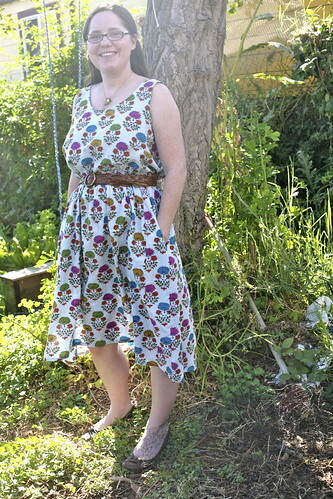 the breezy dress (wearable muslin) is so lovely! I've got to try doing an FBA sometime...I'm just too scared to mess it up. I have been intimidated by FBAs forever. I mean, it basically looks like you're just cutting the pattern into bits haphazardly, right? I was pleasantly surprised by the process, though - I followed the instructions, cutting out the pattern based on my high bust size and making the adjustments, and while my first attempt was too big overall, it did immediately FIT around the neckline, shoulders, and arms, which is where I tend to run into problems when I cut out a pattern based on my bust size. There was a certain amount of magic to it! Pretty fun! I am still really intimidated by the idea of doing an FBA on a more complicated pattern, though. The dress is simply gorgeous! Really - I think it's about one of my favourite things I've seen that you've made for you. Oh and I think I have read somewhere that cup size is relative to chest measurement, so that a 32DD would be the same cup as a 34D or a 36C... hmm... sounds vaguely implausible but really, you don't look out of proportion! I am liking your hair longer. I find the word 'bangs' for fringe so amusing. Where the heck did that ever come from? I've been growing out a fringe for a while now too. Saves on haircuts and I get to use cute clips if I want to. After typing, "bangs, bangs, bangs, and more bangs," I had the same thought - "what a weird word!" and "where did that come from"? Fringe makes so much more sense, and is a much prettier word. You are right about the cup sizes, according to everything I've read. But even so it turned out I was two whole cup sizes off! 32G! That is not a size you can pick up at your average store. I am officially in the "specialty bra shop" world now. Le sigh. That said, a good bra makes you feel like you've lost 10 lbs. It's powerful stuff! inder you are awesome in every way! i give you sew * (corny pun, i'm sorry, i couldn't resist) much credit for sewing your dresses! wow, oh wow! i have been so discouraged with sewing for myself. maybe someday i'll try again. but the truth is between nursing and having four kids who keep my clothes looking clean for about 2 seconds, i don't have the motivation right now. dresses are pretty much completely out and since it's so hot here i can often find cute ts and shorts inexpensively through j crew factory store, which also gets a good rating for their clothing making practices. so i haven't quite worked up the motivation to sew for myself yet. Aw, thank you! Yes, I have long been (a) intimidated by sewing for myself or adults generally; and (b) dissatisfied with the fit of things I sew for myself. But with Joe's recent refusal to wear home-mades (which really hurts my feelings and makes me wonder what I will be sewing in future if Maggie decides to do the same thing! ), I am motivated to learn. I know the grass is always greener, but I envy ladies who can just slip on a spaghetti strap dress or sweet top and go, without needing "additional reinforcements"! ;-) This pattern (or a similar tank like the wiksten) might fit you right out of the envelope. But I hear you - I like J. Crew too! Banana Republic and J. Crew are my go-tos for work clothes. 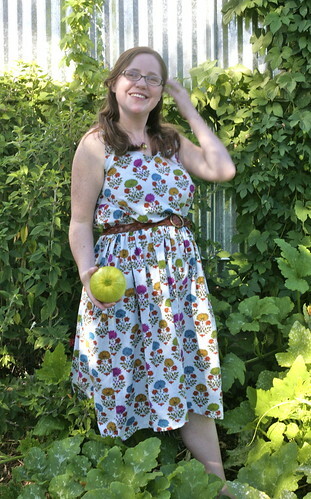 Inder, you look fantastic in your new dress and in your wildly romantic garden! Congratulations on tackling the adult clothing. I started sewing for myself a bit but gave up after everything I sewed made me look pregnant (hello post-baby-food-baby...sigh). I have the same problem as Rachel...my A bust seems to have disappeared after nursing..that combined with the post baby fat makes me want to never think about my own clothing again...which is sad because I used to love dresses and have a whole cupboard full. Maybe reading about your ventures will inspire me to give it another go..At the moment I am enjoying making cute dresses and blouses for my one year old and I dread the day she tells me she wants store-bought clothing. Anyway, the bangs...yes cute but such a PAIN when they keep falling in your eyes and face when you are running after kids or working...I think you look beautiful without! That's fabulous that you are learning the ins and outs of fitting for some selfish sewing. I "borrowed" the book from my mom a couple of years ago but still haven't taken the time to really read it. Guess it's time to take another look! I'll likely never make a dress but I have my eyes on a shorts pattern at Oliver +S. (Grainline Maritime Shorts Pattern) It goes through all of the adult sizes so I could buy the pattern once and make the same shorts for the rest of my life. Which has a certain attraction as I like to sew not think about what I'm going to wear. And bangs. I cut bangs 2 years ago and haven't looked back. Why? They hide forehead wrinkles! And after my first baby the dark spots from the pregnancy all decided to live in my forehead wrinkles and made me look even worse than just wrinkles. The spots have faded but the bangs are still here. Lengthening a bodice, and lowering darts (which I have to do as well since even well supported 32Gs are not exactly "perky") are actually pretty easy alterations! I highly recommend you check out that book - Fit for Real People. It's dated, but excellent. That shorts pattern is really cute! I don't really wear shorts, but even so I've been loving the versions I see online. Another reason to love bangs! I have a large forehead, too, so there's that. I bow down to your ability to make patterns fit you! This is one of the instances in life where it pays to have a teeny-tiny bust (I should actually probably be making small-bust adjustments...but I'm too lazy). This dress looks fantastic on you. I love that you added the high-low hem to give it a little something extra. Gorgeous!